The deadline to cut your rosters down to 28 or fewer players is SUNDAY. If you've got multiple teams, you can check the legal status of all your team rosters. This link is also available on the multiteam tools page. If you haven't specifically answered "yes" or "no" yet, let us know if you're keeping each of your teams in 2016. Deadline is December 31 or we assume the unanswered teams become Orphans. A reminder of things to know in the off season and prepping for 2016. Scroll down toward the bottom - we're in the "Carryover Selection" phase. You can keep up to 28 players. You'll pay the 2016 salary for all the players you keep and whatever's left is all you have for the Redistribution Draft and free agency - no additional cash to you until April. The Phase One Draft list is open - you can work on it now. The final deadline will be set when the league fills - roughly about 2 weeks after it's full. See the South Siders League Draft Index for updates, including links to some past drafts as examples. B Movie Actor League - reminder, your Phase One draft lists are due MONDAY night at midnight EST. See the league draft index. Your league is FULL and we now have a final date for your draft lists - about 2 weeks out from now. See the Five Boroughs League Draft Index for updates, including links to some past drafts as examples. All positions now final and we pulled out about 200 players from the list who are no longer active. Coming within the next few days we'll add the winter set of new players to the list. If you have Yahoo! mail you might not be getting email messages from the game - things like broadcast messages from other teams or notices of trades. I've just started getting delay messages that eventually become rejects as the source IP address for our emails has been flagged for "customer complaints." I'm pretty sure BWB is not the only client using this email source, so there's little I can do at the moment. One of the main tasks for me this winter is to find a new solution for email. Slight modification of the Redistribution Draft process, which was changed in 2015. Rather than post draft results round-by-round and allow adjustments to the rest of the list, which meant five different list submissions/modifications. BWB will post Round 1 and Round 2 separately (with list adjustments in between) and then do Rounds 3-5 in one batch. New Players? - My current plan is to go through the 40-man rosters in the next few days and by the end of the upcoming weekend we'll have the new players added to the list. Any players currently on 40-man rosters who aren't in BWB yet will get added - and then that's it until players start appearing in 2016 MLB games. See the B Movie Actor League Draft Index for updates, including links to some past drafts as examples. Both players were just automatically pulled off rosters. A larger change - starting pitching stats for the BWB playoffs are now used only within 7 games of the selected MLB game for hitters instead of 20. Codification of league structure and the concept of "orphan teams" plus the cash awarded to orphans to help rebuild. Clarification is made for owners who reconsider and take back their orphaned teams - they will not get the extra orphan cash in most situations. Updated prize structure - division winners now get their team free in the next season, along with some other adjustments. Once again, BWB will explore a technical approach to allow for some potential rule changes in how game lineups are determined. Fall trading period #2 is now open through Sunday, December 20 at Noon EST. Also continue to work on picking your carryover players - up to 28 that you keep for 2016. That deadline is Sunday, January 3 at Noon EST. You must have enough cash to pay for players retained and your current cash is all you'll get until Opening Day for other needs in the offseason including the Redistribution Draft and free agency. The first step before you can do any trading or pick your carryover players is to indicate if you're keeping each of your teams in 2016. You must answer "yes" before you may submit any trades or before anyone can contact you for trades. Deadline is December 31 or we assume the unanswered teams become Orphans. Trades are now open - you have until November 29 for the first trade session. The second session will extend through December 20. You can also begin choosing your carryover players - visit your team roster(s) for a link to do that. Final deadline is January 3. If you've got a lot of teams, don't wait until the final 1-2 weeks! Some retired players automatically removed from rosters. Positions with an "x" at the end still need to be verified - it will probably be early December until that's complete. Players of the year are now final standings - there's a financial update posted for those cash awards. Salaries are final after "premium adjustments" that bump up salaries for MLB statistical leaders and MLB award winners. This includes MVP winners - which won't be announced until November 19 - so salaries will be finalized within a few days of that. One correction - Cleveland RP Cody Anderson now has been updated to have a salary of 518 instead of 100. New leagues are now open - any draft date shown is an estimate and will become final only when a league fills with 16 teams. As part of payback for web problems over the summer, every owner received one extra bonus team (except Cooperstown Club members...you have unlimited teams). First step before you can do any trading or pick your carryover players - indicate if you're keeping each of your teams in 2016. You must answer "yes" before you may submit any trades or before anyone can contact you for trades. Deadline is December 31 or we assume the unanswered teams become Orphans. Trades are now open - you have until November 29 for the first trade session. The second session will extend through Dec 20. You can also begin choosing your carryover players - visit your team roster(s) for a link to do that. Final deadline is January 3. Positions updated for 2016 - these are final, except for where you see an "x" in the position or secondary position - these players are not yet verified (and some may be removed from the game for 2016). Salary cap - The 2016 cap is 37729 - very close to 2015's 37328. Teams have been given their 2016 cap cash (the actual distribution is enough to get the team in your league with the smallest cash balance up to the cap level). Things to know headed into the postseason - and prepping for 2016. Prepping for 2016 - I'm working on player salaries and positions for next season. By Tuesday night, I'll have set up your options to indicate if you are keeping your team for 2016, new orphans, and allow you to start setting your carryover players for your roster. Neither owner has ever won the Benchwarmer Bash. Final Result: Towanda defeated Lake Erie 4-2; Congratulations Jay! Benchwarmer Bash - Bash Semifinals Complete: Games 5-6 posted. Benchwarmer Bash - Bash Semifinals Games 1-4 posted. Benchwarmer Bash - Bash Quarterfinals Games 1-4 posted. Three series tied 2-2...one is done with a sweep. We'll finish off the series late Wednesday night. Benchwarmer Bash - Federation Semifinals - Games 4-5 posted (earlier than planned). Next update expected either very late Saturday night or on Sunday morning. Benchwarmer Bash - Federation Semifinals - Games 1-3 posted. Benchwarmer Bash - Evening update - Federation Quarterfinals - Games 6-7 posted (Games 4-5 were up this morning). Semifinals begin on Friday. Stay tuned as site/roster/player updates start to take us into 2016. It's possible some may start late this week or during the weekend - but things may be a little quiet until the first week of November. In the meantime, we're starting the Benchwarmer Bash. This is a season-ending tournament to crown one champion for all of BWB. Federation Quarterfinals - Games 1-3 posted. Next update on Thursday. Things to know for the remainder of the postseason - and prepping for 2016. Game 7 coming on Monday. A note on developing seedings in the Benchwarmer Bash. Any listed wild cards shown in italics are tentative and subject to be knocked out if a higher-ranked team doesn't win its league championship. Deadline for any lineup changes for Bash teams is Monday night, October 26 at midnight Pacific (10/27 3 AM EDT). What to look for in the schedule? Games 5 & 6 on Sunday. Game 7 on Monday. 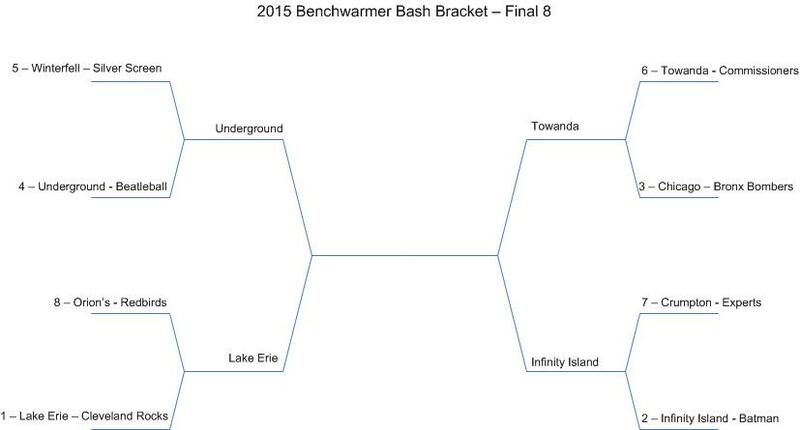 Seedings and wild card slots are starting to take shape for the Benchwarmer Bash. If your team has a shot to make it, you have one final shot for a lineup change that will cover the entire range of games for the Federation tournaments and the Bash. Deadline is Monday night, October 26 at midnight Pacific (10/27 3 AM EDT). My fault - guess I didn't finish off Game 3 and thought I did...all of Game 3 for all leagues now up. I'm a day behind plan - let's look for Game 4 on Saturday and we'll see what goes from there. Early look at the potential field for the Benchwarmer Bash - Wild cards are subject to change depending on the results of league championships. Who will be in the Benchwarmer Bash? Check out some early potential entries for the federation championships. Of the 41 league champions in 2014, 28 of them repeated as division winners - 22 are still alive with conference championships and a chance for a repeat league title. Reminder that you can make lineup changes for the 2nd week if you're still alive. Deadline is tonight - Monday night October 19 at midnight Pacific (Tuesday morning 3 AM Eastern). We assume there's enough rest between starts that at the beginning of the second week, we don't look backward to the previous week to check for 4 days of rest. For example - If your P1 pitched in a clinching Game 6 of the first week, his spot still comes up first in the 2nd playoff week - and he will pitch. You can also move them around the rotation spots without worrying about the games of rest in between weeks. The 4 games of rest in between starts does hold within any given playoff week. There's no penalty for moving players into the rotation from spot, taxi, or minors in the second week (you don't know what games are coming up next). Pitching performances will not be repeated within this 2-week stretch, even if it's the closest start to the random MLB game used for playoff scoring. We'll start posting Week 2 results - Championship Week - as soon as possible - perhaps as soon as Tuesday night. Game 7 either very late Sunday or on Monday morning. If you choose to change your lineup between playoff weeks, the deadline is Monday night October 19 at midnight Pacific (Tuesday morning 3 AM Eastern). Playoffs - Game 4 posted - See playoffs for all leagues. Of 64 teams that participated in the Federation Playoffs in 2014 (first step of the Benchwarmer Bash, 39 won division titles this season. Of the 8 Federation champs, 5 made the playoffs this year. Both of last year's finalists in the Benchwarmer Bash - winner Crestone Current (Moneyball League, Kevin Connors) and runner up The Natty Lights (Beer League, Jesse Roche) won their divisions again this season. Games 2 and 3 are up and posted for the playoffs - See playoffs for all leagues. OK - let's try this again 24 hours later. Game 1 of the playoffs rescored using the proper saves/bullpen rules for scoring. I know at least one result changed (involving the person who caught the error). See playoffs for all leagues for links to the playoffs for your leagues. New league playoff links should be working now too. Oops again. We need to go back in time. I forgot that the module that scores games is slightly different for playoff games than regular season games...and I did not copy in the 2015 rule changes for bullpens and saves. It may not change any results, but on the chance that it might - I need to rescore Game 1. If you choose to change your lineup between playoff weeks, the new deadline is Monday night October 19 at midnight Pacific (Tuesday morning 3 AM Eastern). Of 164 division winners in 2014, 77 repeated with division titles this season. 45 of the division winners from last season finished below .500 in 2015. From the 164 divisions that existed in 2014, 31 division winners are franchises that never before won a division title. Of the 41 league champions in 2014, 28 of them repeated as division winners. Week 26 Transactions posted - Week 27 deadline for the 2nd week of the playoffs is TENTATIVELY Saturday, October 17 at Noon Eastern but I'll probably move that back once I see when I can start posting playoff scores (soon). Required step for setting up brackets completed - all the tiebreakers for the 2015 playoffs resolved. Some random web errors popping up as people attempting to make final adjustments to playoff lineups. So, sure, you've had since Sept 24 to make lineup changes but since we all procrastinate (and I'm still cycling through seeding tiebreakers) - new deadline is Sunday at noon EDT. While BWB takes a few days to set up the 2015 playoff pages/brackets (and concentrates tonight on Pirates vs Cubs), look for some news and notes here on the home page to recap the completed season. This season, there were 5 divisional ties. In 2014, 7 divisions ended in ties - how did those teams fare this season? Loser: Bemidji Blue Ox (Sam Campbell) - This year: Won the division by 8 games. Loser: Venice Beach Longshots (Ken DeGroot) - This year: won the division by 10 games. Loser: South America Piranhas (BWB League Office - an orphan team) - This year, under new owner Sam Campbell, won the division by 2 games. Week 26 lineups - for the first week of playoffs - are due Saturday, Oct 10 at Noon Eastern. Five division ties to break - Results are in!!! Quahog won 4 of 6 head to head during the final three weeks. Hornsby won 4 of 6 head to head during the final three weeks. We have 5 divisions with ties to break in a Game 151. Matchups to be posted Saturday - games scored probably on Sunday. Week 26 lineups - for the first week of playoffs - are now due Saturday, Oct 10 at Noon Eastern. I like to keep a little tension going - so Game 149 tonight, then Game 150 will be posted late on Friday night. Longball League - McGuire Division: Uptown Slackers (owner Sam Campbell - 2nd win in 2015) - Eleventh season owning the team - first division title! With the 2015 rule change, transactions for cuts/IR moves should now be enabled for Week 26 in case you need to make room on your active lineup for the playoffs and can't put a player in the minors or on the taxi squad. No transactions for Week 27 - this is the last chance for cuts. Some people found a back door on attempting to sign free agents this week - but there are no signings in Week 25 so all attempted signings and contingent releases were deleted. You'll be setting your lineups for the first week of the playoffs. As you start putting together your Week 24 pick ups and cuts, remember that Week 24 is the final week for free agent signings. Your signings on Week 24 are first eligible to play in Week 25 - and we do not do any pickups in Week 25 to add guys for the playoffs. See the weekly transaction schedule for more details. As you set your lineups for Week 23, remember that games in Weeks 23-25 allow for use of players on your Taxi Squad and Minors to be used as "September call ups." You may - but you do not have to - put these players in a particular order in your lineup setting. See the rules and the note on the set lineups page. Trades are closed for the season. Your team/league finances page now has a table at the top outlining the transaction fees/refunds for players you put on IR. If you're looking to cut a player on IR, this will let you know the first week you can cut the player and still get the fee refunded. Contract extensions for 2016 and beyond are due Friday 7/31 by 7 AM EDT. See the extension page for information including rules or tips, or just go straight to the contract submission form. 2015 Rule change - Pitching rotations can be reset for Week 16 with no penalty for games between starts between Week 15 and 16. So, for example, your P5 in Week 15 (who will pitch Game 90) can become P1 in Week 16 and still pitch Game 91. Orphan Team Blowout - All remaining orphans are FREE for the remainder of the 2015 season. And you'll pay only the discounted orphan rate in 2016. Some teams still in contention for titles - otherwise you can maybe use advantageous waiver order positions to start rebuilding the team now. Bencwarmer emails should now be working again (but another incident that may have me looking for a new web provider in the off season). We're back to games exclusively inside your divison for Weeks 12-14 - here's a chance to make a move. The Week 12 deadline is extended a couple days in order to give time for everyone after the web outages. Week 13 will end up being the short week as we need to get back on schedule to Friday deadlines - See transaction/lineup deadlines. First round draft picks are now in the player list and available to sign. Website back and running - Week 11 deadline is Tuesday morning at 9 AM EDT. Website update: I talked directly to tech support Saturday afternoon and there's no ETA. BWB is not the only site affected and they were trying to figure it out. We'll extend the transaction/lineup deadline a little bit to allow people to get done what they had planned Friday night/Saturday morning. This may change to a later time, but at the moment I've reset the Week 11 deadline to MONDAY night, June 22 at 11 PM EDT. The Week 12 deadline will be moved back a day or two (or more) accordingly. Sorry for confusion...my web service said site would be down June 19 from 12AM to 8AM EDT. So, you'd think that's Friday morning, right? When site didn't appear to go down Thursday night I called support on Friday morning and the guy said - "oh yeah...that's done - all set"
Site is back up but having trouble with database connection - I have a support ticket in for assistance. Any page trying to connect to db fails right now. I'll extend deadline as necessary once it's working. I will not be able to post transaction results for Week 10 until Sunday 6/14 - when the next week is a short week I typically want to post ASAP. The website will be offline for server maintenance on Friday, June 19 from 12AM-8AM Eastern. Look for this year's first round draft picks to be added to the player list for the Friday June 26 transaction deadline. Remember the 250 transaction fee to put a player on the IR instituted this season? Your fee is refunded if the player stays on your roster 11 or more weeks - or is still on the roster on Week 27. If you put a player on IR during Week -2 Transactions, this week (Week 9) is the first time you can cut or trade away the guy and still get the rebate. Rather than wait until season end, refunds will be distributed as soon as eligible. Coming soon is planned a table on your financial page - or a separate page - to help you track your team's status. Rule Change Reminder - For the last several years, all teams received a cash distribution of 1000 at the last transaction dates for May, June, and July. Starting this year, there is no extra cash doled out until July. Reminder - in order to keep in sync between the BWB weeks and the MLB game numbers, we shift the transaction/lineup deadline day every five weeks. For Weeks 6-10 we're on Saturdays. See the full list of deadlines for the season (including times). Reminder - Week 5 is the final week of maximum salary rebate for any player you cut: 80%. After this week it goes down 4% each week until after Week 15 when salary rebates for cuts are done for the year. See the full schedule of transaction dates and salary percentages. FYI - in situations of suspended games, like Friday night's KC-CWS game, we count the game/stats at time of game completion. Also a reminder, I pull game stats the day after a game is played. As corrections or scoring changes come in, I make those changes. But once a BWB game is played, there is no going back to take into consideration the corrected stats to fix a completed game. If you do not see "Yes" in the confirmed column, I do not have your payment or indication that it's on the way. I will start locking transactions for your teams on Wednesday night. After a couple of years of being slack on this, I will hold to the payment deadlines and transaction/roster restrictions as last season some teams fell through the cracks. Contact me if you have any complications. Cash for games won and division placement works on a 2-week lag. So the results for Week 1 games will be converted into cash disbursements for Week 3 (etc., etc.). I'm in the process of moving some things around on the website - for the moment, checking out head-to-head records, standings for all leagues, standings for previous seasons, and short versions of standings like on your home page will still show 2014...or may not work at all - hopefully most of that can be fixed this weekend. Just to be clear, there are no rule changes in place for 2015 on how lineups are done regarding positions and starters who play but have no plate appearances. It is something I'll try to test out during the season and think about for 2016. BWB 2015 Schedule Posted. How to find this on a regular basis? Weather permitting, Chicago and St. Louis will be the last teams to get to Game 6 - on Monday (thanks to a rainout already) - and that makes Tuesday the earliest we can post a game. For teams who are on the other side of the spectrum - with very little cash left, the 2000 will be figured into any free agent signings, trades, IR fees, etc. If you're cutting players and you get a salary rebate - that extra cash WILL be checked against your team's cash balance and the maximum 5000. If the rebate causes your balance to go over 5000, you'll lose the excess. Deadline Monday 4/6 at 11:59 PM Eastern - Week Zero Reminders - include maximum cash balance of 5000 heading into season, a cash distribution of 2000 to everyone, and you must have a legal roster after this week's transactions! Setting your first week's lineup is not due until April 12. Week minus 1 Transactions Posted - Week Zero deadline is Monday, April 6 11:59 PM EDT - this is an extension from what would have been 7 PM Sunday. You'll have a short turnaround time before Week 1 lineups due Sunday, April 12 - so use this coming week to do as much setting as possible. Quick reminder of 2015 rules changes - including a new transaction fee for IR moves (refundable if the player is on IR for 11 or more weeks). I'll make a decision on possible changes to lineups by next week (I couldn't look at it in time for the intended March 1 decsion). Contract extensions are now open. Unless you need to cut cash reserves down below 5000, I always suggest you wait until July. This is fantasy baseball 365 days a year. Teams are now making final preparations to get their teams ready for the regular season. We are not drafting any additional new leagues for 2015. But, if you'd like to attempt to turn around a struggling team, these orphan teams are available...pick up an existing team and rebuild it, rather than start from scratch. Are you already a BWB team owner and want to add teams? Email us if you want an orphan team and we'll set you up. Tuesday posting #3 - Resolution of contested picks for players picked by 3 or more teams. Scooby Doo draft - a few fixes on the second page of contested results for salary 100 (this is still a manual process, so please let me know if you find errors). It looks like the transaction error-checking never accounted for the number of players making over 250 when you put a guy on Injured Reserve. It handles the 40-man roster limit OK. I'll look at fixing that soon, but in the meantime, if you're getting a "250 error" even when putting a guy making more than 250 on IR, you should be OK for now. There is still an email issue that I haven't solved - trade email and other automated email may not reach intended targets - particularly if the recipient has gmail or yahoo (only 2 of the biggest ones). Scooby Doo League Draft. Phase One Draft - Posted today: Unique draft picks, a listing of the number of teams picking contested players, and resolution of contested picks for players with Salary 100. Startup draft is complete! Hang on until after the Redistribution Draft is posted for returning leagues and we'll open up the league for normal transactions. Scooby Doo League will be the final new league to draft for 2015. Are you just signing up for Benchwarmer for the first time? Do you have extra bonus teams that you want to use? We still have plenty of orphan teams available who need owners! Included in the orphan teams is one remaining team in the Moneyball League. This is a private league that collects its own fees and in turn offers its own prizes. Let me know if you're interested and I can get you in touch with the league owner. Scooby Doo League - league is full! and the final due date for your draft list is Sunday night March 15 at 7 PM EDT. Check out the Scooby Doo Draft Index which includes links to past drafts as examples. American Association Draft. Phase One Draft - Posted today: Resolution of contested picks for players of Salary > 100 picked by 2 teams. If during Round 1 processing, we had to move up players from later rounds in order to get you three players, all the remaining picks were moved up in order, so you should be set automatically with someone in Round 2, Pick 1 and beyond. Any players you have left in your list in Rounds 2-5 who have already been selected have been retained so that the list stays intact - but we've marked on the list which players are already gone so that you can replace them. So for this first attempt to update the picks weekly and to get everything working, we'll adjust the Round 2 due date to Feb. 22 instead of Feb 15. Expect weekly submissions for Rounds 3-5. Redistribution Draft - Lists due TODAY with extended deadline to 7 PM EST. Only Round 1 will be processed this week and then you get a shot to readjust your list - but remember that each team gets three players at a time, so make sure you pick at least enough rounds/picks to ensure you get three players when it's your turn. If you have leftover incomplete picks and errors, you can also with one click remove all the incompletes (make sure you're not using the link to clear all your entire drafts). American Association Draft. Phase One Draft - Posted today: Resolution of contested picks for players of Salary > 100 picked by 3 teams. American Association Draft. Phase One Draft - Posted today: Resolution of contested picks for players of Salary > 100 picked by 4-5 teams. American Association Draft. Phase One Draft - Posted today: Resolution of contested picks for players of Salary 100 picked by 2-5 teams. American Association Draft. Phase One Draft - Posted today: Resolution of contested picks for players of Salary > 100 picked by 6 or more teams and those ranked #1. As you go back to your draft lists, you should see all 5 rounds of picks; you don't have to start over. Round 1 will be locked but you can make changes to Rounds 2-5. Everybody else on your list moves up. When you go back in for Round 2, your "new" Round 2 starts off as your original Round 2 picks 2 & 3, plus your original Round 3, pick 1. Subsequent rounds move up too. American Association Draft. Phase One Draft - Posted today: Unique draft picks, a listing of the number of teams picking contested players, and resolution of contested picks for players of Salary 100 picked by 6 or more teams. Reminder: the 2015 Redistribution Draft is now open. Deadline is Sunday 2/8/15 Noon EST. The 2015 Redistribution Draft is now open. You have 2+ weeks to make your selections (see the link on your team roster). Deadline is Sunday 2/8/15 Noon EST. Since many of you have a ton of teams and I may still have a bunch of orphans to process, the first picks for the Redistribution Draft will be due Sunday, Feb 8. With the new multiweek posting/adjustments, updated lists will be due each Sunday after that. For the Royal Flush League, I was working with a couple teams today to get them to legal lists - not sure if I can post preliminary results on Tuesday night - it could now be on Wednesday night. I can pretty much guarantee I can't get through the orphan list to do roster carry overs by Thursday night - so let's just extend this now and give you all the extra time - Roster decisions are now due Monday, January 19 at Noon EST. Don't forget!! - Carry over choices due by Thursday! The only hitch here is if I can't get the orphans done by then and if that's the case, I'll give you the weekend to finish. Comments on several reoccurring requests for how lineups/benches are used - I'll investigate technical changes to the process and determine by March 1 whether any rules will be modified. Player additions (based on 40-man rosters) delayed due to the tech issues - will try to put in later this week.